If you listened to the heart of Western New York’s Polonia, you would hear a polka beat. Maturing in the Post-War Era, polka music could be heard coming out of taverns, homes, and cars. Polka songs were used in jingles and to get candidates elected. For a generation, the epicenter of Buffalo’s polka exploitation was Ruda’s Record Store. This Polish emporium would be the driving force of polka music regionally and nationally while becoming an international shopping destination. Born in Buffalo’s Polish East Side, Don Ruda took up the accordion at the tender age of seven. By age 12, Don was playing weddings and anniversaries. In the late 1940s, he joined the Polka Trio which became famous in Buffalo for its “Mruk Polka.” Written for Buffalo’s first Polish American mayor, Joseph Mruk, the single sold over 3,000 copies in Western New York alone. When not performing, Don was teaching the accordion at Edwin’s Music Store. In the mid-1950s, Ruda came to the conclusion that if he wanted to share polka music with the wider world, they would need a place to find it. 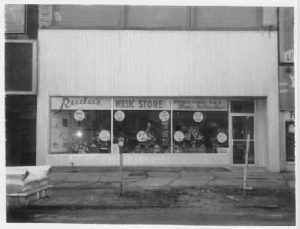 He rented a storefront on Ridge Road in Lackawanna and Ruda’s Records was born. Besides being stocked up with the latest polka 33s and 45s, Ruda’s Records also sold other genres including jazz, blues, early rock, and other specialty recordings. To get people into his store, Don was a master showman. In the early 1960s, Don booked Fabian Forte, then at the height of his teen heartthrob popularity, to do an event at his store. Customers packed the tiny store, overflowed onto sidewalk, and down the street for as far as the eye could see. As the times changed so too did Ruda’s. If you were looking for the latest release by the Dynatones, Don would have it on vinyl and eventually on cassette and CD. Don and his wife Virginia expanded their business by selling Polish imports and Polish American themed products. From dried mushrooms to Polish dolls, calendars of John Paul II to Polish flags, and windsocks to pins, Ruda’s offered it all. The selection of polkas and Polish items made Ruda’s a must stop shop for tourists to Western New York. On January 11, 1997, Don Ruda passed way. While this would be the end for many businesses, Ruda’s Polkas & Polish Gifts stayed open, with Virginia at the helm. By then the store had moved to William Street in Cheektowaga and would thrive into the new millennium. Ruda’s Records could survive the loss of its founder, but technology would be its undoing. As MP3s and CD burners became commonplace in the early 2000s, CD sales plummeted. Customers would have a burned copy of an album before Ruda’s even had it in stock. On June 30, 2007, Virgina Ruda closed the doors of the 57-year-old business for the last time, and ending an epoch in Buffalo’s Polonia. Block, Melissa. "Internet the Last Straw for N.Y. Polka Shop." NPR. NPR, 25 June 2007. Web. 06 Feb. 2016. Filipowicz, Debora. "Business Beat." Am-Pol Eagle [Cheektowaga, NY] 25 July 1985: 3. Print. Graczyk, Mark. 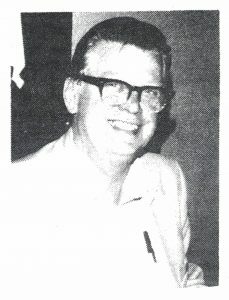 "Personality of The Week - Don Ruda." Am-Pol Eagle[Cheektowaga, NY] 14 May 1981: 3. Print. Gramigna, Glenn. "Ruda's Records Is Closing next Month after 57 Years. "Am-Pol Eagle [Cheektowaga, NY] 31 May 2007: 11. Print. Kohan, Mark. "Don Ruda Touched the Lives of Many." Polish American Journal Feb. 1997: n. pag. Print. "Ruda's Closing - End of an Era." Editorial. Am-Pol Eagle [Cheektowaga, NY] 28 June 2007: 2+. Print. "Rudasrecords.com." Rudasrecords.com. Internet Archive: Wayback Machine, n.d. Web. 06 Feb. 2016.